Hello, everyone! This is Arca, and to make up for not posting yesterday, I decided to make two posts today. 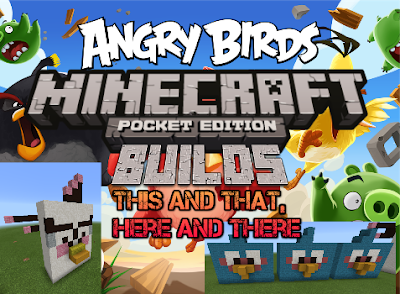 According to the last Google+ poll, the two Angry Birds builds I will be showing you in Minecraft PE are Matilda (the white bird) and the three Blue Birds. So, without further ado, let me show you guys them! As you can see above, Matilda is a white bird. Her beak is yellow and orange with an underbite, and she has pink cheeks. Her eyebrows are thin. She has a three feathers on her head that are black with pink at the tip. She has two more long feathers visible at the side that are also black and pink. As you can see above, each Blue Bird is identical to each other. So it was very easy building Jim, Jake, and Jay (those are the names of the blue bird triplets). They have a mostly blue body and dark-yellow beaks that are pointy on the top side. They have pinkish-red eyelids underneath their eyeballs, and no eyebrows. They have two blue feathers on top. You can see the back view of the build above. They each have a black tail feather shaped like almost an addition sign. I hope you enjoyed. Thanks for reading this. Stay tuned for upcoming posts, and a post every day of the summer. I will see you next time. BBYYYYEEEEEEEEEE!!! !